The research done by the team led by J.-J. Vasseur is listed under the theme « Nucleic Acids : from their role as targets to the therapeutic and diagnostic potential of their constituents and analogues ». The skills of the team are the synthesis of natural and modified nucleic acids for the study of their interactions with biomolecules. The main aim of this research is to better understand the pathogens involved in emerging infectious diseases for diagnostic or therapeutic purposes. Thus projects developed by François Morvan with the help of Albert Meyer concern the use of DNA biosensors for the study of nucleic acid interactions between them (HCV genotyping) but also between saccharides and proteins (DNA glycomimics as bacteria antiadhesives). The project developed by Michael Smietana on artificial genetic systems explores the dynamic and programmable formation of nucleic structures between modified oligonucleotides and natural nucleic acids. Last but not least, Françoise Debart with the help of Christelle Dupouy and Carine Baraguey, explores synthetic methods to synthesize RNA, RNA prodrugs and capped RNA to study capping enzymes of emerging viruses as possible therapeutics targets. 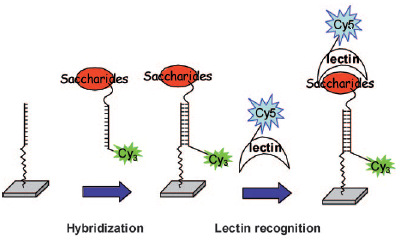 Context : Interactions between lectins and carbohydrates are involved in the recognition of cell surfaces by pathogens. Synthetic molecules mimicking the natural carbohydrates inhibiting the colonization of the host could be an alternative to antibiotic therapy. The difficulty in obtaining a large diversity of glycomimics and the need of a miniaturization technique to study their interactions with bacterial lectins without huge amounts of materials are some of the hurdles that must be resolved. Results : Using DNA chemistry, we developed a flexible and rapid synthesis of glycomimic conjugates exhibiting various carbohydrate residues with diverse spatial arrangements and environments. We designed a DNA glycoarray allowing to rapidly determine the affinity (IC50 and Kd) of these new glycoclusters with lectins using only few picomoles of material. Among more than 80 glycoclusters synthesized, some of them exhibit a strong binding to lectins of Pseudomonas aeruginosa. One is able to inhibit the adhesion of PA with an IC50 < 5 uM. Application : Anti-adhesive and anti-biofilm compounds against Pseudomonas aeruginosa. Perspectives : Two different ANR programs have just started in 2013 to continue this challenging project with the study of the 7 different lectins of PA. The first program (PA-Control) concerns the screening of complex polysaccharides from the company ELICITYL while the second program (Glycomime) concerns the study of the relationship between the structure of glycomimes and their mechanism of action and the discovery of new targets. Collaborations : S. Vidal, Univ Lyon 1, Y. Chevolot, E. Souteyrand, E. Centrale Lyon, B. Lina, Hôpital Laennec Lyon, A. Imberty, Grenoble, A. Dondoni, Univ Ferrare, Italy. X. Chen, UC Davis, USA. O. Vidal Univ Lille, B. Darblade, Elicityl, Crolles. Financial supports : CNRS interdisciplinary program “Interface Physique Chimie Biologie”. ANR-08-BLAN-0114-01 FluDNAGlycochips and Lyon Biopole. CNRS and La Région Languedoc Roussillon for a PhD student grant, Vaincre la mucoviscidose, ANR-12-RPIB-0003-03 PA-Control and Eurobiomed, ANR-12-BSV5-0020-01Glycomime. Awards : G. Pourceau, New journal of chemistry Poster Prize, 2010 ; IS3NA (Internat. Soc. for Nucleosides, Nucleotides and Nucleic Acids) Poster Prize (Lyon France,2010) ; Thesis prize Fondation Balard 2011. 17 Publications : 2 Biosensor Bioelectron, 2009, 2013, 6 J Org Chem, 2008, 20092, 20102, 2012 ; 2 Bioconj Chem, 2010, 2012 ; 2 ChembioChem, 2009, 2011 ; 1 Eur. J. Org. Chem, 2013, Cover of the issue, Angewandte Spotlight ; 1 RSC Adv,2012 ; 1 Chem Soc Rev, 2013. 4 International Invited Conference s, Kyoto 2008, Fukuoka 2009, Lyon 2010, Barcelone 2012. 26 oral communications. Results : Original NS5b probes were designed for genotypes 1a/1b, 2a/2b/2c, 3a, and 4a/4d. Robust polythiolated probes were developed and anchored with good efficacy on maleimide-activated microplates and gold electrodes. ELOSA test was able to detect short and long HCV amplicons diluted 100 times with good sensitivity and specificity. Moreover, the direct and real-time electrochemical detection by DPV allowed reaching a detection limit of 10 fM in a complex medium with a good reproducibility. Application : Rapid multi-detection and differentiation of viral agents. Perspectives : We started a project to extend this microsystem based on ELOSA for the genotyping of emergent viruses like Flaviviruses (West Nile, Dengue, Chikungunya…). Collaborations : C. Chaix, Univ Lyon 1, C. Fournier-Wirth, Etablissement Français du Sang, Montpellier. Financial supports : ANR-09-PIRI-0023-02 VirProbe, Eurobiomed. Publications : New J Chem, 2011 ; Eur J Org Chem, 2013(Angewandte Spotlight), 2 Patents, 2 oral communications. Concept : The ability of boronic acids to react with cis-diol functions led us to envision a DNA-templated ligation to achieve the replacement of the natural phosphodiester with a boronate internucleoside linkage. Occurring through the reaction of two oligodeoxynucleotides such systems employ a boronic acid group at the 5’ end of one strand, while the other would carry a ribonucleotide at its 3’ end. Description : The dynamic assembly of this new borono-based helix has been accomplished through a DNA- or a RNA-templated autoligation process. The assembly was found to be reversibly controlled by various external stimuli such as variations of pH, temperature or by the presence of anions. The versatility of this “plug and play” strategy was readily explored and a polymerization version of this autoligation process is currently developed in the laboratory. Moreover, the needs of our main research activities have led us to develop new synthetic methodologies. Perspectives : Development of small artificial riboswitches those are controllable by simple external stimuli. Collaborations : S. Mueller, Greifswald Univ. (DE) ; I. Barvik, Charles Univ. (Cz), J. Wengel, Odense Univ. (DK), C. El Amri, UPMC, (FR). Financial support : ANR JCJC-11-JS07-005-0 PRODIGY, Région Languedoc-Roussillon (Programme “Chercheur d’Avenir”), CNRS (programme doctorant INC 2013). Awards : M. Smietana, Chercheur d’Avenir, Région Languedoc-Roussillon 2011, France SCF representative at the 4th the EuCheMS Organic Division Young Investigator’s Workshop (2012, Austria), A. Martin, Thesis prize, SCF-Languedoc-Roussillon 2012. Publications : 1 Chem Commun, 2008 ; 1 Org Biol Chem, 2009, Hot paper, Cover of the issue ; 2 Tetrahedron Lett 2009 ; 1 Bioorg Med Chem Lett, 2010 ; 1 Angew Chem Int Ed, 2010, Highlight in Synfact 2010 and Synform (synstory) 2010 ; 1 Angew Chem Int Ed 2011 ; 1 Eur J Org Chem, 2011 ; 1 ChemBioChem, 2012, Angewandte Spotlight ; 1 Pure Appl Chem, 2012 ; 1 Montasch Chem, invited, 2013, 1 Chem Soc Rev, 2013, Cover of the Issue. 14 oral communications (5 Univ., 9 international). Context : A renewed interest in the rapid and efficient chemical synthesis of RNA has grown up since the advent of RNA interference (RNAi) with the high demand for synthetic natural and modified RNA molecules as powerful tools for biological research and therapeutic applications. 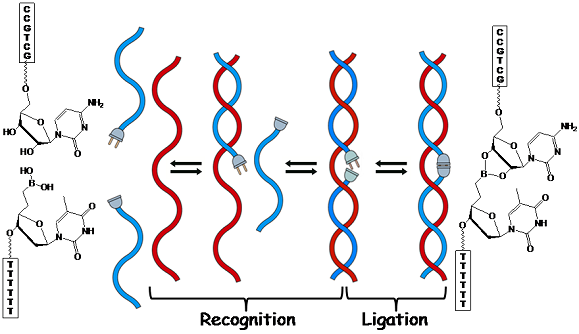 Compared to DNA synthesis, RNA production is more complex because of the presence of 2’-OH with suitable protection to enable successful RNA assembly and to avoid RNA damage during the deprotection process. Results : Of special interest is the use of acyloxymethyl groups as 2’-protection first in our all-base labile strategy which mimics DNA synthesis and provides highly pure RNA sequences efficiently and rapidly without any concomitant RNA degradation or migration (patended and licenced process), and secondly in our prodrug approach where they are removed by esterases inside the cells yielding to the parent active RNA. Applications : RNA production for research and/or therapeutic applications. Scientific Production : Chem Eur J, 2008 ; Eur J Org Chem, 2009 ; Biorg Med Chem Lett, 2009 ; J Org Chem, 2011 ; Org Biomol Chem, 2013 ; 1 Book section 2010 ; 1 Patent 2009 (WO 2009/144418 A1), 2 Invited International Conferences in Industrial International Conferences (Las Vegas and Amsterdam, 2009), 1 Licence Agreement 2011 (L10213, CNRS, UM2, Chemgenes Corporation), 4 Oral communications. Context : Besides RNAi field where efficient RNA synthesis is required, the chemical production of 5’-functionalized RNA with triphosphate (TP) moieties is of great interest for many biological applications as the ligation of RNA molecules, the detection of viral responses via activation of the RIG-1 protein, the induction of antiviral immunity and in the enzymatic synthesis of 5’-capped (7mGppp)-RNA. In the same way 5’-capped RNA of defined and appropriate length in sufficient quantity and purity are useful for crystallography studies of their complex with enzymes involved in the viral capping system to use them as potent antiviral targets. Results : We developed a new synthetic approach on solid support using H-phosphonate intermediate for the synthesis of the 5’-TP or 5’-GpppRNA where RNA assembly was performed with PivOM technology. The synthetic procedure represents a highly efficient alternative to the existing enzymatic methods since great quantities of 5’-functionalized RNA could be obtained with excellent purity. Applications : Structural studies of RNA-viral enzymes complexes by crystallography, 5’-TP siRNA for synergic effect of gene silencing and innate immune response. Collaborations : B. Canard, Univ Marseille ; C. Condon, IBPC Paris ; C. Grison, CEFE Montpellier ; L. Biegelman, AliosBioPharma USA, M. Manoharan, Alnylam USA. Financial supports : CNRS Prog. Interdisciplinaire MIE 2009, European Program FP7 SILVER 2010-2014, ANR program (RNA-SARS-SPA) 2012-2015. Scientific Production : 1 Org Lett, 2010 ; RNA, 2012 ; 1 Plos Pathogens, 2012 ; 1 RSC Advances, 2013 ; 1 PNAS USA, 2013 ; 1 App Cat, B 2013, 1 Book section 2012, 1 Patent 2009 (PCT/US09/69201), 5 oral communications.